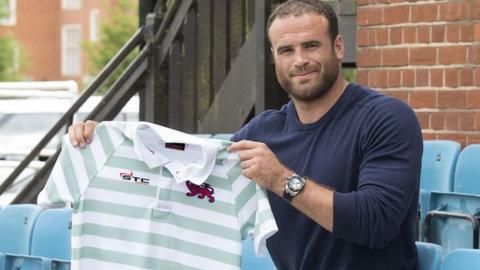 Wales and British and Irish Lions centre Jamie Roberts is set to make his Cambridge University debut against Worcester on Wednesday. The match at Cambridge is part of the build-up to the Varsity Match against Oxford University on 10 December. Roberts, capped 77 times by Wales, will then join Harlequins for the reminder of the season, where he will remain until the end of the 2017-18 season. Cambridge University host Dean Ryan's Warriors at Grange Road. Cambridge University: Simon Davies (Jesus); Ilia Cherezov (St John's), Mike Phillips (Emmanuel), Jamie Roberts (Queens'), Michael Mortimore (St Edmund's); Fraser Gillies (Hughes Hall), Don Stevens (captain, St Edmund's); Will Briggs (Magdalene), Max Montgomery (Emmanuel), Dave Spelman (Jesus), James Kilroe (Robinson), Ian Nagle (Hughes Hall), Henry Rose (Jesus), Daniel Dass (St Catharine's), Sam Farmer (Wolfson). Replacements: Paddy Calvert (St John's), Demitri Moros (St John's), AN Other, Rob Hall (Downing), Lola Erogbogbo (Clare), Seb Tullie (Emmanuel), George Williams (Clare), Oliver Clough (Jesus).